About the right way to pronounce it… while I was still considering between “Daburu” and “Daburyuu”, at the rehearsal for Dome Jejung said, “That should be Daburyuu shouldn’t it!” so we decided on “Daburyuu” (LOL). After Tohoshinki’s activities were suspended, when the announcement of the trio’s “THANKSGIVING LIVE IN DOME” was announced, I received a request to write the lyrics for songs that they can sing at Dome. At that time, I was entrusted with writing about the real feeling of the trio. I’m sorry but I can’t write the details about it here. From now on, I’m going to write about my own feeling… but I could really feel that the trio are sincerely wishing to work as 5 again. I believe that it is also the wish of the duo and of course, the fans. I was wondering how I should convey that wish and feeling into a message to fans, thus I created a wrote something called “If you have a message to HoMin, would you tell me your message?” on Twitter and Ameba. I remember that at that time, I didn’t have that many followers on Ameba, but thanks to everyone who spread it on the Internet, I received a lot of messages. No, I was entrusted with them. A great number of messages contain the words “We’re waiting for the day you will come back” and “We’re protecting a place for you to come back to”. When the song was sung at Dome, went on the download chart, and was uploaded everywhere… I received a lot of messages on what the true meaning of the song is. Since I wrote that song with the intention of conveying the true feelings of the trio and not my own, thinking of the trio, I’ve been keeping my silence to those comments even though I’m usually a talkative person. I also made sure that I did not write about anything that is over-sensitive…. However, since they don’t have any promotion for “The…” and “THANKSGIVING LIVE IN DOME” this time and I didn’t receive any word from the trio thus I decided to gather my courage and write this. “W” is the symbol of 5 and belong to 5. “Waiting” is about the day that the 5 of them will work together again. “Protecting” is the power of the fans. Those are the feelings of mine, someone who was entrusted with the words from the messages of the trio and the fans. I only found out recently that you wrote the lyrics for ‘W’! The song has a beautiful melody, but the most touching thing about it are still the lyrics… (T_T) My question is, did you write the lyrics after JaeChunSu spoke to you about their feelings? Please tell me that their true feelings were conveyed in the lyrics. Please! I did incorporate the trio’s thoughts and feelings when I was writing the lyrics. With regards to the song, I thought it’d be best to first listen to their heartfelt wishes… I wrote the lyrics afterwards. 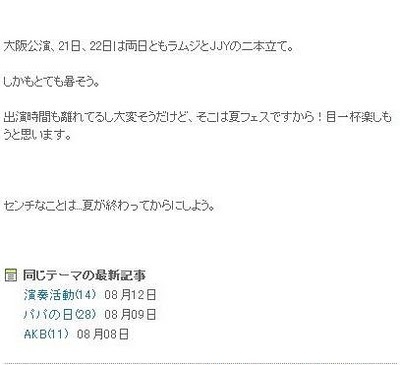 Osaka performance, 21st and 22nd (both days), we will perform as Lambsey (T/N: a unit of 2 persons. Guitarist: Inoue & vocalist Yuki Yamashita) , and also with JJY. And, the weather seems to be very hot. The performance time (T/N: of Lambsey and JJY) are far apart, so there may be some difficulties, but a-nation is the summer festival! I’ll try to enjoy as much as possible. For sentimental matters… let’s leave it open until the summer ends. I forgot to say…..in the main song “Intoxication” of XIAH junsu’s “XIAH”, I am playing the guitar. Since I have not heard the final mix of “Intoxication”, I do not know if it is included, but if it wasn’t cut when making the mix, you should be able to hear them. One more information for those who raised the question. He gave me the final OK for the song’s arrange just 2 days before the final mix…. I worked through the night for total 4 days. The schedule was very tight and it was back-breaking work, but the collaboration feeling was enjoyable, and it was also very informative~! I may look naive, but the true myself is the “One down!” type, so I always make one-down-arranges. But this time, thanks to Jun-jun, I was able to work until the very last minute! Working together with them, I myself can achieve, that is one of their charms. T/N: Can you hear the 4-bar loop session in the background? 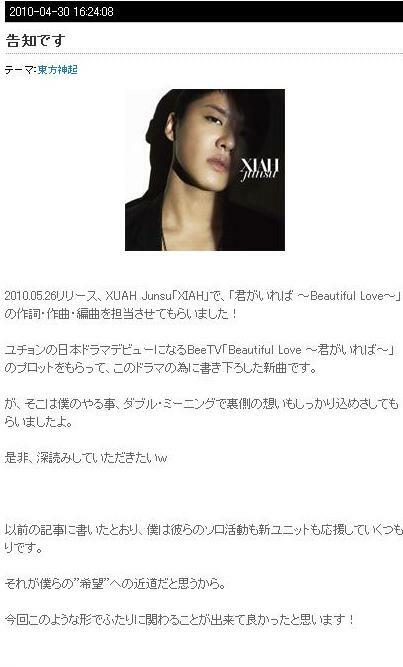 For the song “Kimiga Ireba ~Beautiful Love~” in the album “XIAH” by XIAH junsu, to be released on May 26, 2010, I myself wrote the lyrics, composed, and also arranged the song! I received the plot of Yoochun’s Japanese debut drama of BeeTV, “Beautiful Love ~Kimiga Ireba~”, and wrote the song especially for this drama. Oh, since it is my works, I have included my special thoughts, the lyrics hold double meaningｓ. Please try to read my hidden words/thoughts. 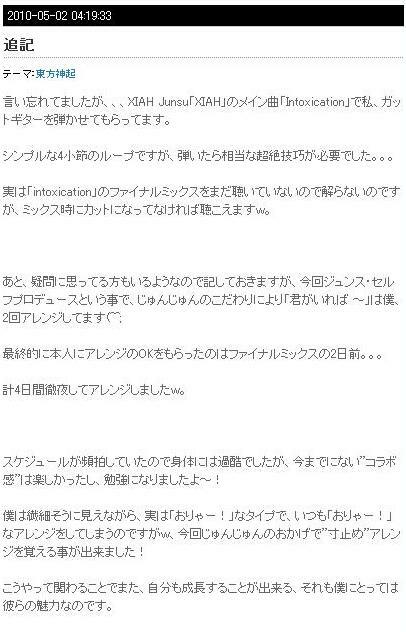 As I have previously wrote here, I am going to support their solo and new unit activities, too. That is what I believe; the crosscut to our “wishes”. I am delighted that I could get involved with the two members! For the contents of the movie, please look forward to them. Anyway, my tear gland was so stimulated. It was, yes, refreshing tears. so I did my best to fight back my tears at those times. If I were to see the movie by myself, I would have been in tears. And, Tohoshinki’s “With All My Heart”, which we can hear in this movie, marvelously matches word by word with the movie’s contents. When the song was finished, I was full of hope. The movie reminds us that the song leads to a happy end. The official release of the movie will be in September, a long way to go, but everyone, please go to the theaters to watch the movie. After the preview, I was able to talk to the director Kouzuki-san and producer Arikawa-san. It is a rare case that not the artist but the composer of the song himself receives red carpet treatment. 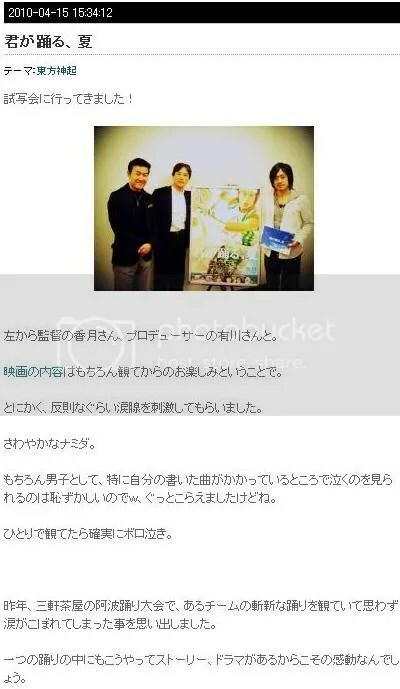 Especially, Arikawa-san was a fan of Tohoshinki from their debut days, and our thoughts were the same, we would like to see the 5 members singing “With All My Heart” together….. He is planning a fan event, so let’s look forward to them! I am again thankful for this encounter. 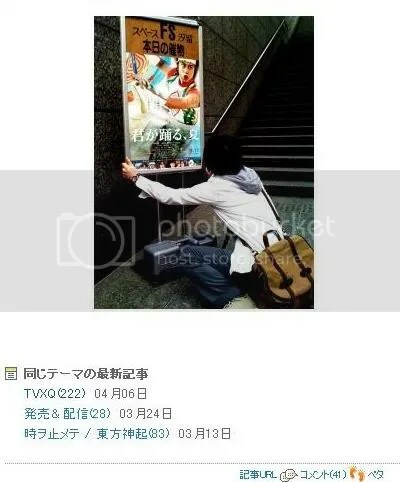 We warmly shook hands, promised to go out for a drink together, and then, I left the theater. To the best of my ability, I will support this movie “Kimiga Odoru, Natsu”! 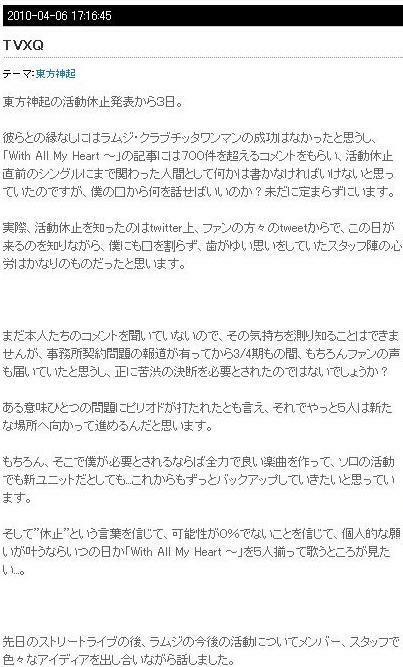 3 days have passed since the announcement of the suspend of Tohoshinki’s activities. We do not think that our Lambsey’s CLUB CITTA live (T/N: March 26 in CLUB CITTA KAWASAKI) could be successful without the deep emotional ties with Tohoshinki. For my article “With All My Heart~” (T/N: Pls click here for the trans), there were more than 700 comments. Since we were involved with them in the last minute before their suspending their activities, I thought that we should write a message, but, what should I talk about? I cannot decide, even in this stage. 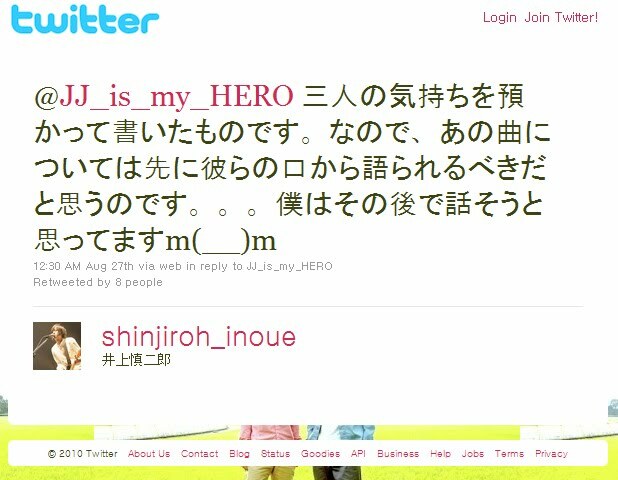 In fact, I knew of their suspending their activities through the Twitter, through one of the fans. I believe that the staffs’ strain of worry should have been great, they didn’t say one word to me, they should have become very strained. I have not heard the comments from the members themselves, so I do not know how they are feeling. But, 9 months have passed since the media reported their problem with their entertainment company. Of course the voices of the fans have reached them, so it should have been a tough decision. In a sense, one problem was concluded, and at last, the 5 members could advance forward to a new place. If I am in need in such places, I would do my best to make a lovely song whether it is a solo activity or a new unit.. I would like to support them in the future. And, I personally would like to see the 5 members singing together “With All My Heart~”, believing that their activities are “suspended”, and the possibility of their resume is more than 0%…. After the recent street live, the members and staff discussed many ideas for the future of Lambsey, and we decided to continue singing Tohoshinki’s songs that we ourselves are self-covering, showing gratitude to Tohoshinki and the fans, and believing in their comeback. The only thing that we can do is; to convey the heartbeat songs in a voice alive. We know that we cannot be their substitute…but when you are really lonely, if you really want to cry, please come to meet us. We will always sing their songs. I am not a reviewer, I am a musician, and, as I have said many times, a fan of Tohoshinki. At any rate, let’s together support the 5 members in the future! Everyone should share the same feelings. And, in order for you to find Tohoshinki related topic, I have made a special category for them in my blog. Hope it would be a help to you.